The International Journal of Social Quality is published by Berghahn Books in association with the European Foundation of Social Quality. In the recent past, the needs of people have only too often been subordinated to the needs of the economy and politicians have lost sight of the fact that government's primary purpose should be to serve its citizens. 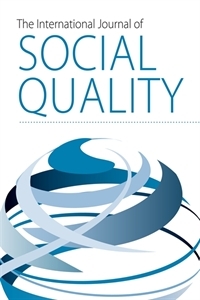 The International Journal of Social Quality was conceived with the aim in mind to refocus the political and sociological debate and to provide a forum for comparative and interdisciplinary study and discussion of crucial issues affecting the quality of life in Europe and elsewhere. The International Journal of Social Quality aims are: to explore practices and discourses on, and to raise crucial issues with regard to, social quality in contemporary societies; to engage in an ongoing debate on perceptions and expectations of social quality in different societies and in what way these are affected by factors such as religion, class, age, gender, nation, and others which are shaping individual and group identities; and to evaluate how economic policies or political decisions affect social equality, encourage research that identifies and examines policies and identify and assess policies that enhance or threaten the quality of life. Each issue is devoted to a major the me selected from the key issues that affect contemporary societies, especially those of the evolving new stage of the European Union, and offering incisive analytical articles on ongoing debates. Moreover, each issue will present an up-to-date examination of the current debates, a bibliography, and a review article relating to the particular theme of the issue, thus providing relevant background information that can also be used as a general reference tool for researchers, policy-makers, and students.